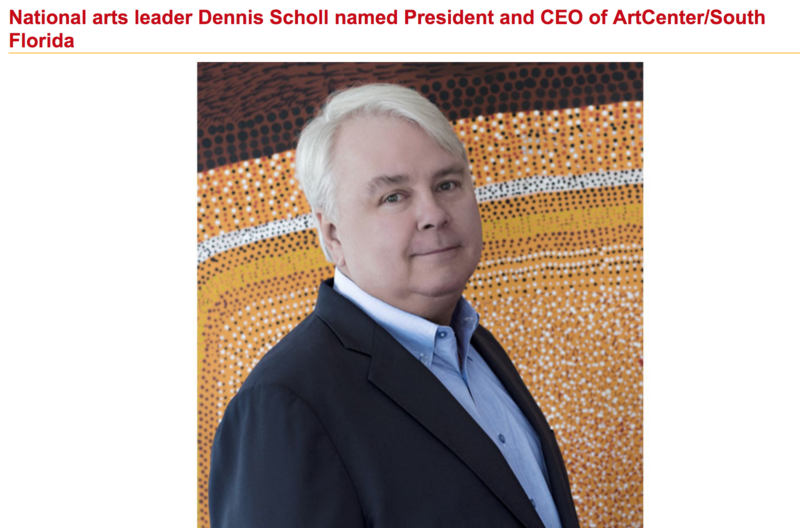 Seasoned arts executive and entrepreneur Dennis Scholl will be Oolite Arts’s new president and CEO, the organization’s board announced today, leading the pioneering arts organization into its next chapter at a pivotal time in its history. Scholl, a change agent known for his ability to scale cultural efforts and enterprises, will focus on creating a holistic environment for Miami’s artists. At ArtCenter, they will be able to learn from the best local and national cultural practitioners, experience ground-breaking exhibitions and work in studios to develop their artistic practice. In addition, under Scholl, the ArtCenter will extend much-needed direct support to resident artists for production, training and travel. The ArtCenter, a major cultural institution in South Florida for three decades and recognized as one of the catalysts in the renaissance of Miami’s Beach’s famed Lincoln Road, recently sold its landmark building, providing the organization with an $88 million endowment to expand its role in serving the city’s growing cultural community. The hiring of Scholl, an entrepreneur, art collector and most recently, the national vice president for arts at the John S. and James L. Knight Foundation, is a “gamechanger” for the organization, said Kim Kovel, ArtCenter’s board chair.